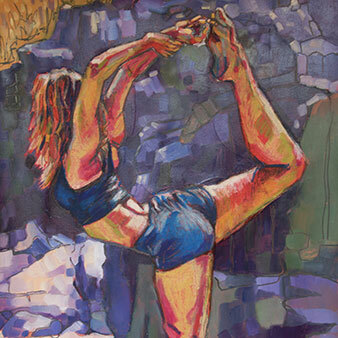 My own studio work embodies my love of Yoga and meditation. I Seek to find balance between faithfully capturing the body in its graceful proportions and allowing creative flow to weave it’s magic with bold colour and creative mark making. I am interested in the creative connection between body, mind and spirit and am developing practice that links creative art and wellbeing. When making works of art we find ourselves occupying the present moment, our attention is focused on what is happening right now. In this way creative practice can be a meditation in itself. Developing our creativity is about stepping into the unknown, taking risks and making choices. It is like learning a new language, and also remembering how to be playful.